There are no photos with those IDs or post 14998 does not have any attached images! Preparations for the 78º edition of the Canoe Festival continue forward in the municipalities of Ribadesella and Parres. We detail all the information about the official campings of canoeists and selleros. As the main novelty, this year 2014, will be enabled a exclusive camping for the participating athletes in the test sellera. This will be located in a corner near the river Sella, in the "Campinos de L'Alisal", the place where the Jira a La Mediana was formerly celebrated. In it, in addition to sleeping, they can also park their vans and trailers. It will be a space of easy access and close to the river for the comfort of all of them. The output will have to do it through the Carreras de Xuncu or Cuevas. On the other hand, the selleros will continue to install their stores in the Prau de San Juan-La Mediana and in the gardens of El Malecón-Instituto. The management of these spaces will continue in the hands of the associations of the council. Three collectives decided to join: the Culture and Sports Society and the festivals committees of Meluerda and Collera. The City Council of Ribadesella will elaborate credentials that the CODIS will give to the clubs that demand a space to park and spend the night. That credential will be collected at the time of registration or withdrawal of numbers, together with the express invitation to the welcome message that will be offered by the Ribadesella City Council on the day of the hoisting of regional flags. That is to say, Thursday 7 of August. The espicha, another of the novelties of this edition, will be held in the Plaza de Abastos. 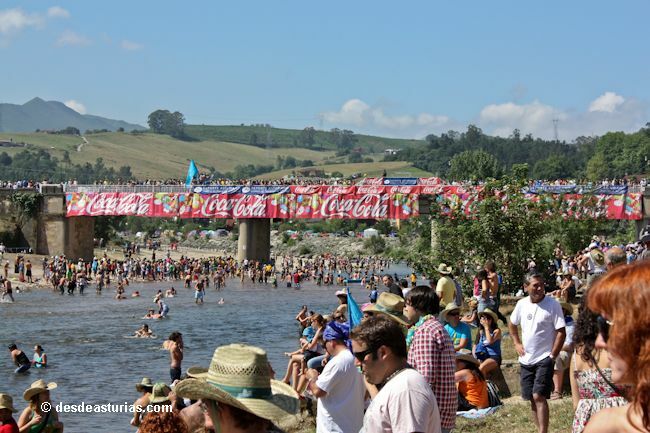 The "selleros" who choose Arriondas to spend the night in Las Piraguas this year, like the previous one, will be able to do it free in the park of La Concordia and nearby, where the camping was organized. From Thursday 7 of August.